Looking for the best way to discover new and exciting craft beer? Look no further! 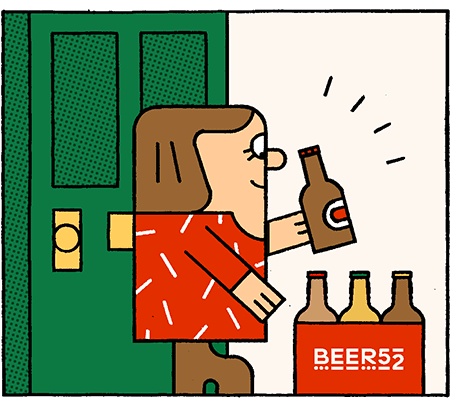 Beer52 is helping our members discover great craft beer from all over the world. The number of micro-breweries around the world is rapidly growing and these breweries are constantly developing new and innovative beers. This is what makes craft beer so great. But it also means it can be difficult to keep up and try new beers outwith your local supermarket's classic selection or without spending hours online deciding what to try next. That's why we've made it our mission to travel the world and bring the best beers back to our members; from the best breweries in the UK, to exciting breweries in places like South Africa, the Balkans, Boston and even Korea. Every month we send our members 8 or 10 craft beers handpicked by our beer buyer, an issue of award-winning Ferment magazine and a tasty snack that pairs perfectly with beer. If you're a fan of dark beer then our mixed box is the perfect choice. Don't like dark beer? Don't worry! Just choose our light only box. After your box arrives, you can left us know what you think by rating the beers and earning taster points that you can spend in our online shop. Our online shop lets you buy more of your favourite beers from the box and discover other great beers that didn't make it into that month's box. Check out some of the amazing beers our members have received recently - don't miss out on next month's amazing theme! Ready to start discovering the best craft beer from all over the world? Join today and get your first box for just £5.95 delivery!